Leighanna Light and Roxanne Evans Stout invite you to create with them in enchanting Taos, New Mexico for a magical, rich and immersive experience in the Autumn. We will explore bookmaking, surface design and various mark-making techniques on metal, paper, and fabric. Then, rearrange the materials to create our own “Fragment Keeper” book to preserve our special memories & experiences. Many of the pieces we will create can be enjoyed simply for their visual splendor, or if you choose, reconstruct them to become integral parts of your unique hand crafted journal. A $200 non refundable deposit is required to hold you space. If you would like to make payments by check only, please contact Leighanna or Roxanne to make arrangements. Roxanne at evanlee@charter.net for more information. Please visit Leighanna’s website page for details of our day to day schedule!! Won’t you join me in the magical land of New Mexico in the springtime? Seth Apter and I return to the amazing Mabel Dodge Luhan House once again for an incredible week creating and exploring A Case of Curiosities. 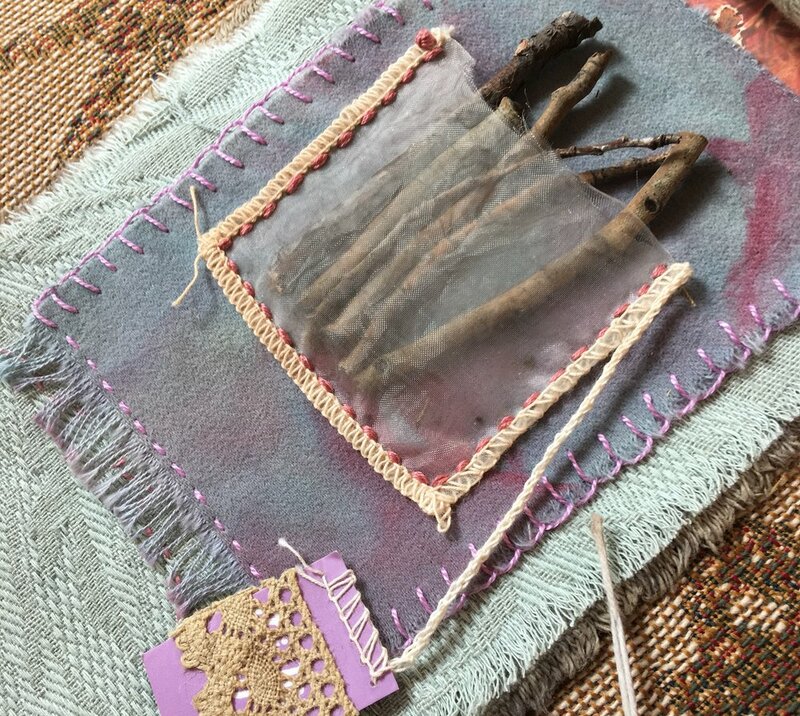 During this magical workshop we will stitch and weave, connect and construct, assemble and build, all the while creating our own Case of Curiosities! Seth and I take turns teaching each day. We create projects just for this workshop, all of which will fit nicely into your own Case of Curiosities. Won't you join us for this once-in-a-lifetime experience of discovery, exploration, inspiration, and most of all, nourishment for your artistic spirit? If you’d like to read about the first time we did this workshop, read my blog post from 2016. You can also read Seth’s blog from our second Case of Curiosities in 2017. This class is already full! But you can contact Seth at shap97@gmail.com to or me at evanlee@charter.net to be added to the waiting list! Imagine creating a handcrafted artist book in which every page is a window into the story of you... either symbolically, or perhaps even a literal window that we will make out of metal, plastic or cardboard. 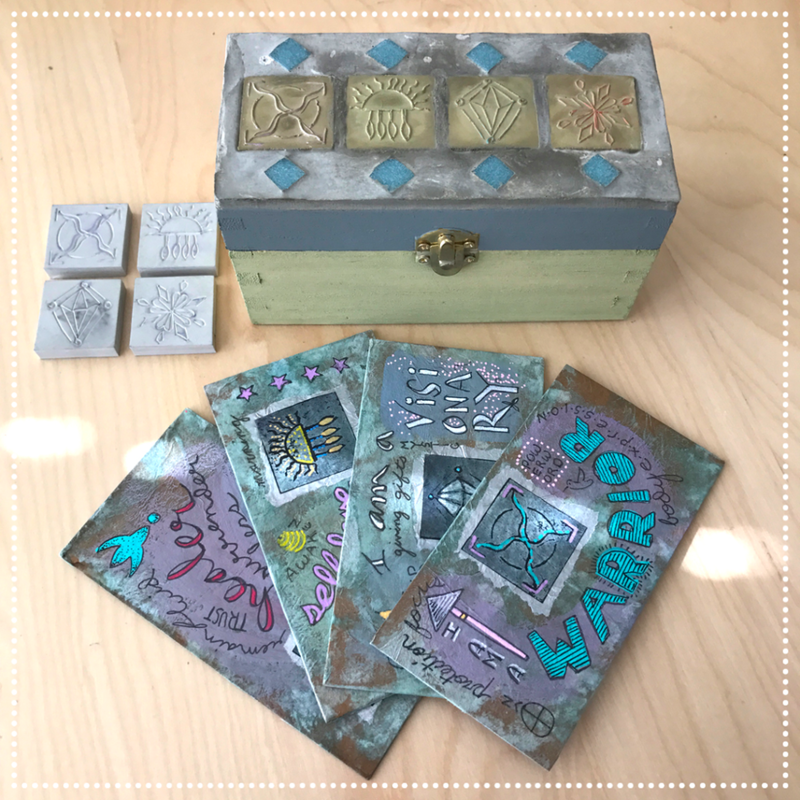 Join Roxanne and she will guide you in creating beautiful books with pages that are rich in color and texture, and pages that sing of the light and magic that is uniquely you! Sorry but this workshop is Full! Follow the "Autumn Winds," and join Roxanne as she journeys to the beautiful seaport town of Port Townsend, Washington. Together we will gather to celebrate Autumn, it's colors, it's changing light and the changes autumn brings in the natural world. We will create a beautiful hand-crafted book that exemplifies what this season means to you. Please contact Leslie or I to get on the waiting list! 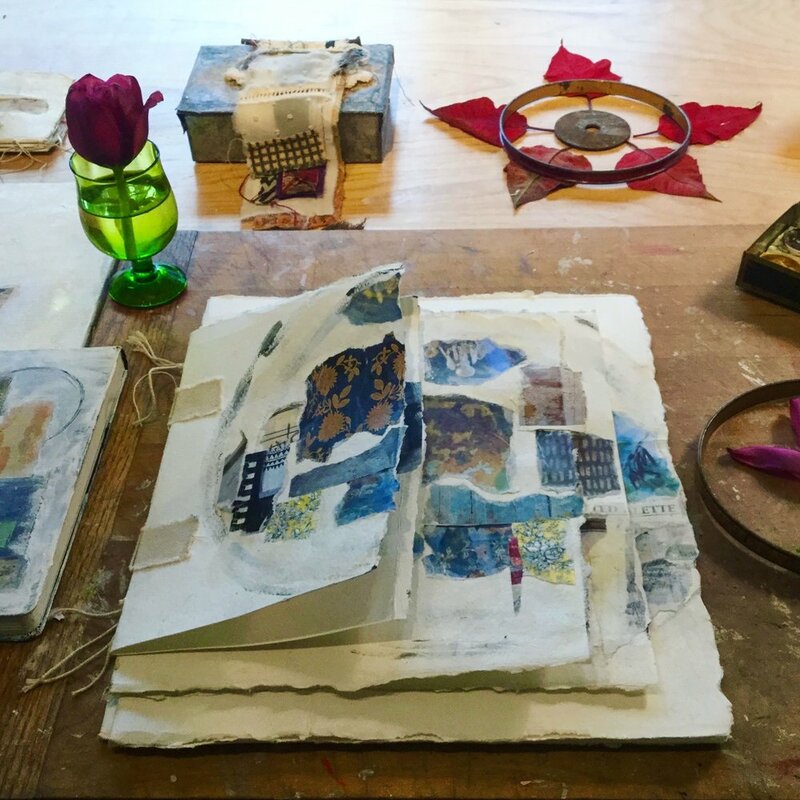 Explore mixed media art and discover inspiring ways to tell your unique story and enhance your creativity for this two week intensive at Pratt Institute with Roxanne Evans Stout. Combining media and techniques such as collage, painting, pan pastel drawing, printing with your own stamps, and adding stitching to your pages, complete unique compositions toward a portfolio. Won't you join me in the Netherlands for three days of Storytelling with Collage! This a new workshop that I created just for this event, where each student will create an artist book from scratch and fill it with beautiful collages inspired by the early summer in this enchanting land. We will paint and collage with beautiful papers and fabrics and I will teach you my special techniques of texturing, layering and design. I will share my creative processes that will inspire and delight you. We will work and play in the Baander Restaurant in the lovely village of Dalen where you will be served a delicious lunch every day. Each student will receive a special gift bag filled with papers, fabrics made just for you. Register early, spaces are limited! Please email Leslie to get on the waiting list. 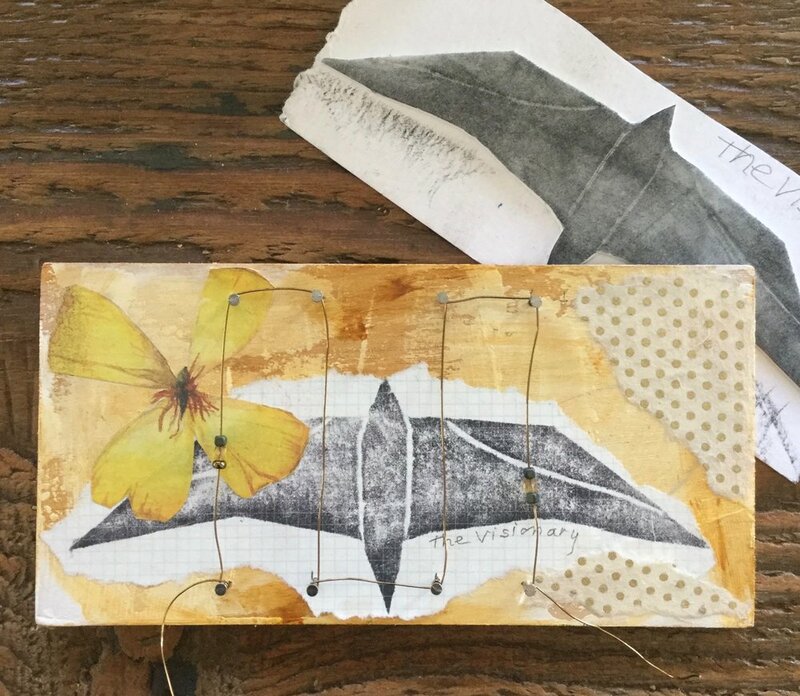 Join Roxanne Evans Stout for a day of creating mixed media collages with her nature-based stencil designs! We will begin our morning by making layered background and textures on our watercolor paper, using gesso, acrylic paints, distress ink sprays and pan pastels. Next we will explore different stenciling techniques on beautiful papers and fabrics, including silk, linen and canvas. Lastly we will collage everything together creating stand-alone pieces of art that would be lovely hanging on a wall or shelf. We will also explore flaps, windows, tags and pockets adding even more dimension to our works of art. What better way to celebrate spring in Saint Louis than to gather together with like souls and make art?! Please join Roxanne Evans Stout, Lorri Scott and Janet Brown at the Margaret Harwell Art Museum for a unique collaborative show that will feature works lovingly referred to as "Storyscapes." Materials include fabrics, papers, threads and wire, objects from nature and botanically dyed prints from nature. As well as the collaborative pieces, the artists will have individual art works featured as well! I will be teaching an amazing workshop at Art and Soul this year! It is called the Alchemist's Book of Treasures, a huge favorite of my students. I would love to have you join me for some creative magic and guide you through making a beautiful artist book. Please follow the link to find out more about me, my workshops and this amazing retreat! 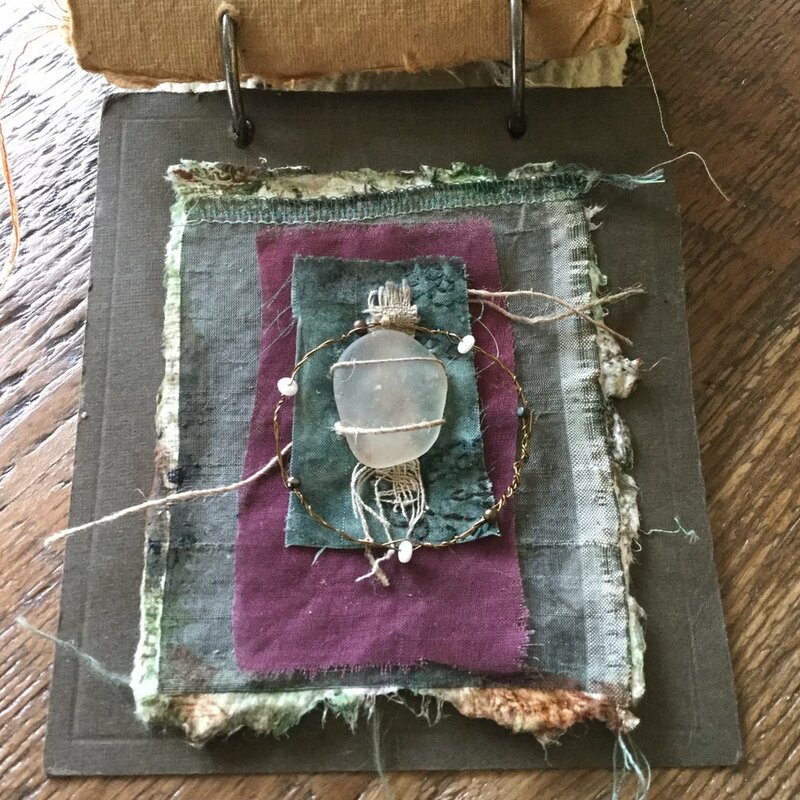 On your artist book pages you will create collaged and wire mandalas representing what is sacred in your life, landscapes from your soul, and paper tapestries inspired by the seasons. 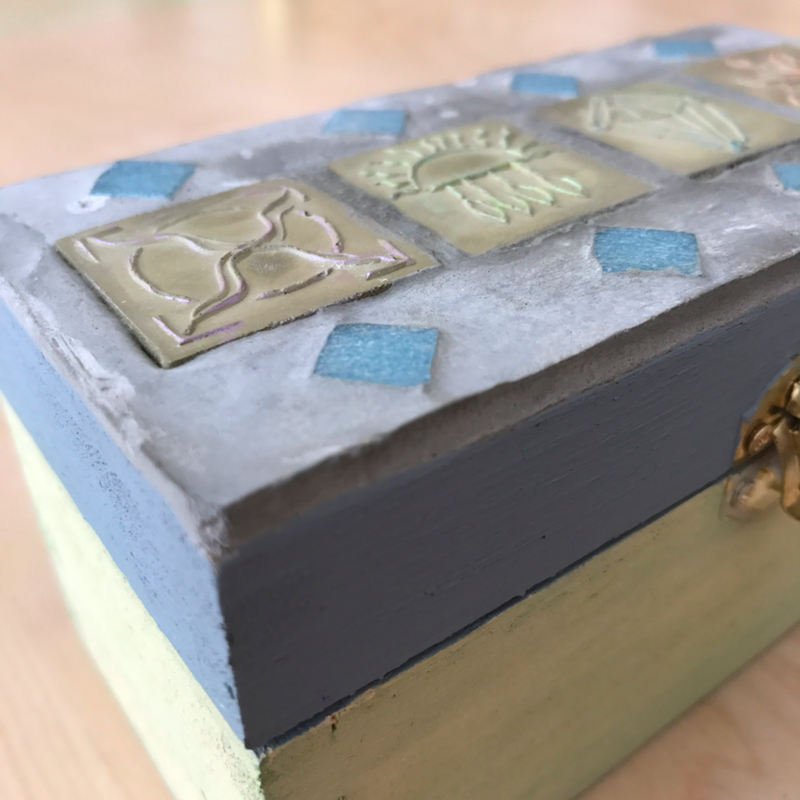 Join Roxanne for this magical workshop where we will joyfully make a handcrafted book that is dedicated to your own days 'between the Sun and the Moon'. And as each of your days unfold, 'between the sun and the moon' you will be inspired, nurtured and enriched ... and discover the essence of your own creativity. Please read more about this workshop and register here. Won't you join us for this once in a lifetime experience of discovery, exploration and inspiration and most of all, nourishment for your artistic spirit during the beautiful month of October. Contact Lyn Bleiler at lyn.bleiler@yahoo.com for registration materials and more information. We have one more opening for this workshop! I have two amazing workshops this year at Art Unraveled and can't wait to go back again! Then I will teach another wonderful workshop filled with my favorite mixed-media processes - A Book of Trees, August 7-8! We will be inspired as we create a handmade book centered around the theme of trees, and hopefully you will learn some new techniques to take home, along with your gorgeous book! Arts & Cultural Travel is about more than seeing paintings in a museum: It’s about private studio visits and impromptu lessons from skilled artisans. It’s about behind-the-scenes invitations to absorb knowledge passed down through generations, like how the vibrant colors swirling around in giant metal pots came from natural dyes, or where to find the purest, most malleable clay for pottery, or the trick to weaving vibrantly colored cotton into kaleidoscopic tapestries. It’s about human connection through art. With guided questions, we’ll discover the answers to what the Warrior, the Healer, the Visionary and the Teacher have to tell us about what we need more of in our lives. to the love of the universe. Read more about this workshop here! I will be teaching three workshops here!! Read More about my workshops and register on the Art and Soul Website! Won't you join us for this once in a lifetime experience of discovery, exploration and inspiration and most of all, nourishment for your artistic spirit? Please email me at evanlee@charter.net or Lyn Bleiler at lyn.bleiler@yahoo.com for registration materials and much more information! During this workshop we will make our own, unique Book of Trees. We will paint, collage, stitch, wire and attach to create beautiful spreads in our books, that are filled with textured papers and fabrics, photographs, found objects and pieces of nature.